There is so much going on in our ministry life right now. Our church is in the middle of a capital funding raising campaign, several senior adult members are ill, in the Bible study class I am a part of several class members have family who are facing serious health issues and even death. Top this off with our own family issues-a son transitioning to a new community but has a home to sale, both sons adjusting to new jobs, an upcoming marriage of my nephew, etc. I feel all I do is worry and grab a handful of M & M’s when I pass my “Happy” jar. All my worrying only causes my stress level to rise. This stress then flows over into ministry life and personal life. There is also the fact that all the M & M’s do is broaden my backside. I always laugh at people when they say ministry life must be perfect. It’s not! We have our times of spiritual barrenness, financial struggles, health issues, and hurt. Because they are our “church family,” we also take on the problems of our members and help them carry their burdens. It gets wearisome at times. To be honest, there are times when I really want to lock myself away from everyone else’s issues so I can focus on my problems. However, I do not and neither should you. What we should be doing is praising God that we have the ability to provide comfort and encouragement to a hurting person and help in their times of need. Yes, struggles come and the world seems to be in chaos, but our Great God is still on His throne and in control of the storms of life. We all want to have the perfect body with no fat or cellulite. We desire our scales to remain at the perfect weight. People do many types of exercises-weight training, swimming, running, etc-in an attempt to maintain a somewhat healthy body. But have you ever thought about your spiritual fitness? In order to grow fit in Christ, we must “exercise” our spiritual side. The Bible is our “coach” and encourages us to be our best. These are just a few examples of becoming spiritually fit. If all Christians committed themselves to doing these exercises like they do physical exercises, we would see more new believers which could lead to less violence and more unity in our world. A pastor’s wife: in the shadows, unnoticed, isolated, talked about, taken for granted, lonely. These are just a few descriptive terms that come to mind as I reflect on the experience of a pastor’s wife. But for all the “negativity” that comes with this very unique role, I also see a pastor’s wife as: supportive, encouraging, available, courageous, and strong. When I reflect on the latter, more “positive terms”, I can only recall from my own experience as a pastor’s wife the ways that the Lord has equipped me. Yes, at times, we may be in the shadows, unnoticed, or isolated, but it is from these places of loneliness that the Lord can develop courage and strength, “prayer warrior” strength, to pray, not only for ourselves, but also to intercede for others. I consider it a blessed ministry of a pastor’s wife to regularly and passionately pray for the members of the church family. People will always talk about us, but people talked about Jesus, so we are in GREAT company! We can’t please everyone, so let us focus on what pleases the Lord (Ephesians 5:10). And for those times when you feel taken for granted for the service you render, remember that our Father “is not unjust so as to forget your work and the love which you have shown toward His name, in having ministered and in still ministering to the saints.” (Hebrews 6:10). Also, as a word of encouragement, two of the best things that have been a lifeline to me as I have served as a pastor’s wife for over 13 years are God’s Word and prayer. Being able to “cry” on the Lord’s shoulder in prayer, and have His Spirit teach me and comfort me in the Scriptures are priceless gifts from Him; I’m sure that many of you have discovered this to be true as well. Pastor’s Wife You Are Appreciated!! FINALLY...............MY KITCHEN IS 99% DONE. The back-splash has not been put up...BUT.....we are IN IT and it is WORKING. Doing without it so long has made us appreciate it more! May you have a wonderful next few weeks.............and enjoy the fall weather. I will see you again in five weeks. .P.S. Just a little update. 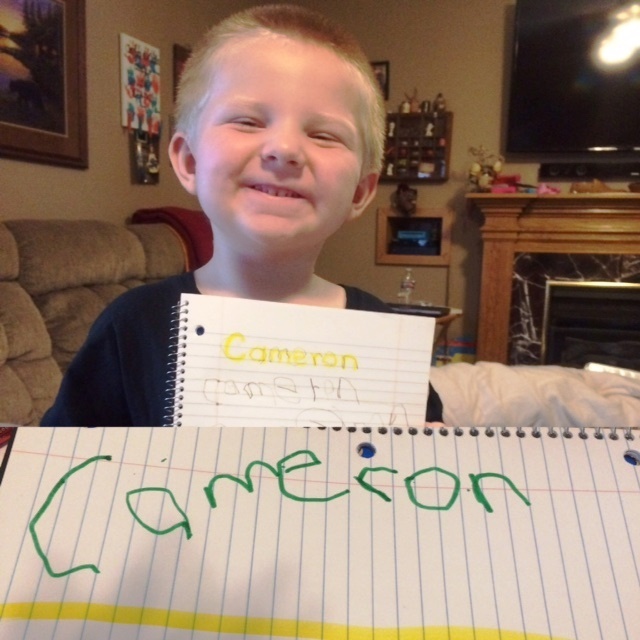 Cameron is four years old and loves cars, building things and pretending. 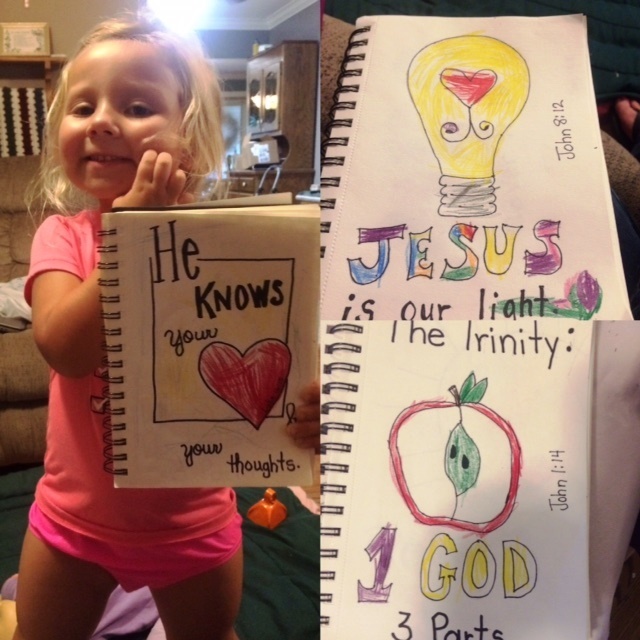 Kinley is three and loves coloring, drawing, letters and numbers.............anything school or craft related. OPPOSITES. I have shared about my methods of "quiet time" with other ladies at a conference that I led, but I have never thought to share it with the ladies at my church. (I guess I just saw that as my private time with God...."
We have a "Secret Sister" Group Messaging.....and one of the ladies posted about her new "Bible Journaling" Bible. It has the pictures already stamped in the Bible and you "color" the pages. She was talking about how relaxing it was, etc. and some of the other ladies started asking questions and seemed interested. I joined in and told them my story of over three years ago when I got interested but was too "CHEAP" so I came up with my own version of "Redneck Bible Journaling". The ladies jumped ALL OVER that...............it was CHEAP and the only thing they really needed to purchase was the "book" which was less than $5. They began questioning me.....asking for examples of my work, etc. Long story short...............they are wanting us to have a "BIBLE JOURNALING WORKSHOP" so we can all learn and work on it together..........especially the ones that are a little nervous about beginning it. I had personally mostly used the "Bible Journaling" for when I was so stressed that my mind would not focus on "reading anything deep." Anyway....I would like to share with you the testimony of one of those ladies. She is in her early thirties, works outside the home and has two small children. 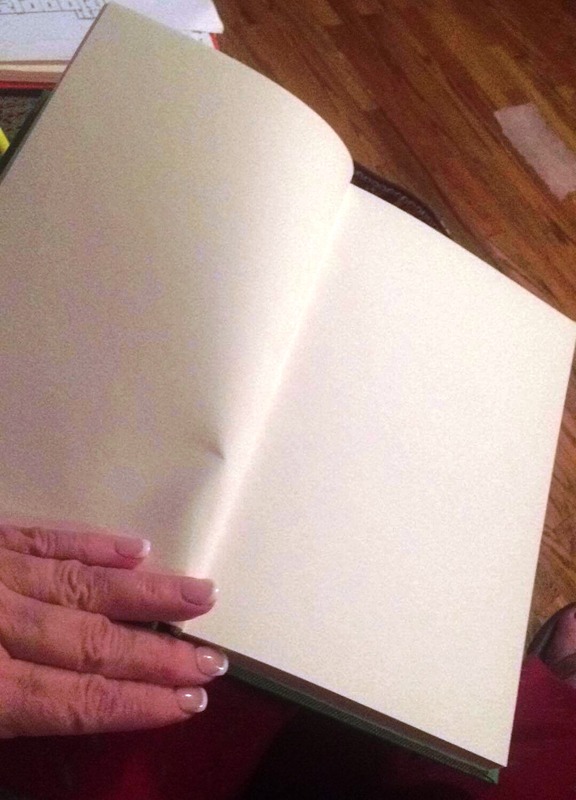 She purchased her a "Drawing Book" to begin journaling. She has gotten soooo "into it" that she claims to be obsessed. She says that it has made her so hungry for God's Word that she MADE TIME to join the Study Group on Sunday Nights, "DETOURS" and she MADE TIME to begin coming to church on Wednesday nights. She shares that she was at a stage in her life where she felt that she did not have time for devotions and quiet time. 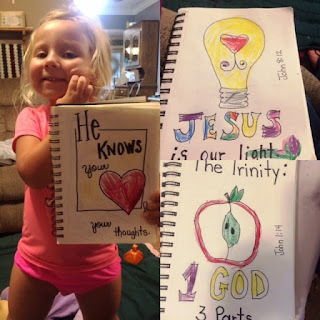 She began the Bible Journaling.....to begin with....just for fun. It was through it that she got convicted of the "hours" she spent playing "Candy Crush" on her phone................so she deleted all of her game apps on her phone. 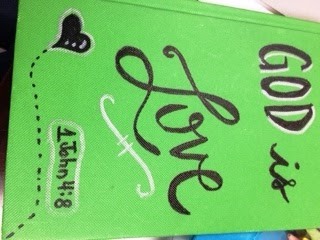 She also shared that the Bible Journaling keeps scriptures in her heart and gives her comfort and peace during the day. It's made her HUNGRY for God's Word. It's convicted her to delete her "game" apps to give her more time for God. It's caused her to FIND TIME to be a part of a Bible Study. It's kept her thoughts and mind to focus on "scriptures" instead of the things in the world. 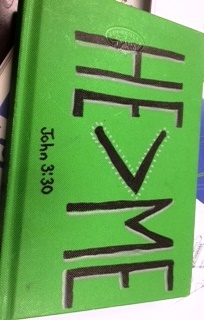 In other words...................seeing what this simple "Redneck Bible Journaling" has done for her..................it has moved Bible Journaling to a whole new level in my mind. Ladies........I know many of you are probably expert Bible Journal-lers............I would LOVE to hear your stories and how God has used this "hobbie". 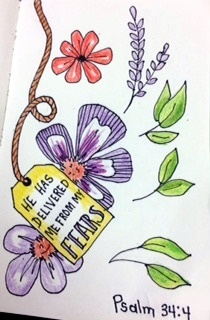 I mentioned yesterday that "Bible Journaling" is a stress relief for me. I am a doodler by nature. I shared with a group of Ladies at a conference once that I have a bit of A.D.D. in me. I get BORED with the same ole, same ole...................so I CHANGE my "devotions" or quiet time. Sometimes I am going through a "Bible Study" book, where there is scriptures and work to do each day. Right now, on Sunday nights, we are going through David Evan's Study...."DETOURS" so I am doing my "homework" each day. Sometimes I use "Devotion Books".....read the scripture....the explanation and then write it down in my own words or what it means to me. Sometimes I "Bible Journal" my Redneck Style. I will find something on "Pinterest"....look up the scripture, meditate and many times go back and read the scriptures before and after that verse. Sometimes I simply read the BIBLE and absorb God's Word. 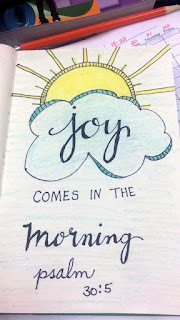 I REALLY enjoy the "Bible Journaling" when I am stressed......because it is relaxing. I can COPY..................but I am not creative enough to do much with my own ideas yet. I hope to get there someday. One day, recently, I was struggling with FORGIVENESS.....so I DID do this one on my own.....but it was quite simple. Copied this from Pat Brown's Facebook tonight.........love it and sooooo true! Don't do this. It hurts people. 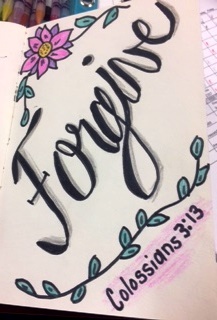 A little over three years ago.....I began to get interested in Bible Journaling. I had a friend from Alabama that kept "pinning" things on Pinterest about it and I became very interested. I began sending her messages and asking questions. Now....three years ago, Bible Journaling was fairly new so the "special Bibles" were expensive. Then I discovered that you MUST purchase "special" markers, pens, pencils, etc.............so that it will not bleed through the fragile pages. I was soooo disappointed.............because I am CHEAP and was not willing to spend the money required to carry out this craft. After Googling it....and searching on Pinterest....I read where if you were not comfortable with "writing in the Bible" just yet....to practice on notebook paper. From that thought.....I found a "Drawing Hard Bound Book" in the art section of Walmart for under $5 and I purchased it. The pages are thick. I took my new "book", my sharpie pens, Crayola colored pencils, Crayola thin markers, pencil and any other supplies I already had on hand and began what I call my "Redneck Bible Journaling." I LOVE IT............and it is sooooo addictive. I love to underline in my regular Bible and write in the margins, but I was very nervous about "messing up" my Bible by attempting to draw and color in it. With my "Redneck Journal"...first...it only cost less than $5.........and second....if I totaled messed up.....I could always "tear" that page out and my book would not be destroyed. 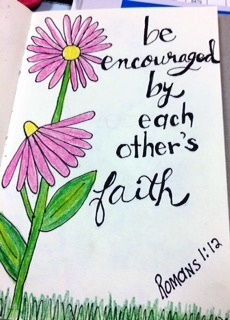 I LOVE Bible Journaling.................it is such a STRESS RELIEF for me. When I complete my book, I will have a book of scriptures and thoughts that have meaning to me. Like I mentioned before.........I have done this off and on for over three years. Later this week I will tell you the story about events that have brought this to a new level for me. 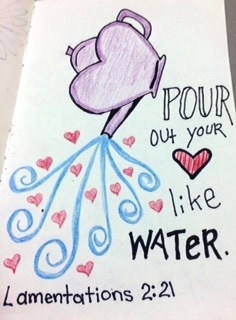 The inside of my Journal............just plain drawing paper. I decorated the front of my "Redneck Journal". And, I also decorated the back. I was blessed this August with the opportunity to attend the ERLC National Convention in Nashville. The theme was "Christ Centered Parenting in a Complex World." Speaker after speaker shared Bible-based theology and applicable advice for the sanctifying process of parenting. The last discussion panel of the event was even addressed to those of us raising "preacher's kids." Now, it is October and I could look back over my notes and share bits and portions of the quotes and tips I hurriedly scribbled down, not wanting to miss the next one. But, instead I want to share two things that I wish the Convention had done a better job communicating. In our group was the sweetest engaged couple. Now, I know I am a little biased as I have known the groom for nearly his entire life and I have treasured the relationship God has given me in his bride. Because these two lovebirds are yet to be parents, they approached the theme of the conference from a different place. Over and over again they heard how hard and difficult and challenging it was to be parents. We all laughed a little about it when they pointed out how the speakers were making it hard for them to WANT to become parents. Yet, they were right. There was little balance in the topics and discussions about the joys parenthood. Don't get me wrong. As a parent of a high school teen, a grade school kid and a pre-school rug rat - I know parenting is often hard and difficult and challenging. But I also know that parenting is often fun and fulfilling and amazing. As a parent, I play and learn and see the world through the fresh eyes of younger people. I don't "have" to, but I "get" to experience life and grow in Christ through three individuals whom God has temporarily entrusted to my care. It is an experience and blessing like none other. This leads me to my second observation. "Parenting" those who are younger than we are in the faith. I believe Jesus referred to it as discipling. As parents to our three daughters, my husband and I pray and desire nothing more than for each of "our" girls to have thriving, growing relationships with Christ. Yes, we work hard to provide and want to raise responsible adults- but, as the conference speakers reiterated over and over again, our role as parents has deeper, spiritual, eternal consequences to consider. 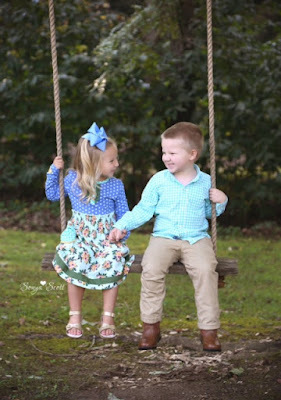 Doing life together, our daughters get to see and know the "real" people that their parents are. The discipling relationships we have with them can be a model for how we as believers can seek out and intentionally disciple others. Whether in our churches or work places, in our friendships and acquaintances, we can intentionally seek out the intimacy and transparency that would allow us the influence to speak Christ into others and allow them to speak Him into us as well. These types of relationships are often messy. Like parenting, they can be hard and difficult and challenging, BUT, they can also be fun and fulfilling and amazing. God can use them to grow us as much, if not more so, than those we disciple. Remember, even though The Great Commission is a command, it is another "get to" not a "have to." It is God's blessing to us, to use us this way. Don't get me wrong. I loved the conference. I gained both theological perspective and practical tips that I have implemented into our family life. It just didn't end there. The feelings are oppressive and overwhelming both individually and especially collectively. The flood of questions and rush of finger-pointers only seem to heap insults onto the injured, yet in our attempts to comprehend and somehow reconcile the events of the last few days, we all try to find someone to blame, some thing to hold responsible - perhaps to predict and prevent another such inexplicable act from occurring ever again. These emotions are easily justified and easy to give into. Submitting to them only binds us again into the spiritually slavery that Christ came to set us free from. As Christ followers and Church members we are the light. We have been set free from these very real, very suffocating feelings, yet even we all too often give into them and literally bind ourselves up into the sinful consequences of succumbing to the undertow and tide of their crashing, devestating waves. How do we stand firm therefore? How can we speak into the darkness? How do we help those enslaved by these feelings? We see people standing in line to give blood. We see politicians and elected officials make pleas for new legislation. We see others throwing in financial support and/or starting other drives for other resources. All these things are well and good, but unless these people are living in and offering others the freedom of Christ, the aid that they give will be temporary. While I am sure their motives are the most sincere, all the efforts, funds, explanations, and "answered" questions will still leave us with feelings of inadequacy and uncertainty. In the meantime, life is already marching on. We are going to work. We are paying bills. We are fixing dinners and doing loads of laundry. The urgency to do something, anything is fading. In the midst of trying to come to terms with what has just happened and to explain the unexplainable, we all want to help. But yet most of us do not see the difference we can make on our own. We discount the power of our prayers and, all too soon, with the passing of not enough time, the passion of our feelings fade and our well of motivation to do something dries quickly up. Before that happens, as we decide to turn off the talking heads on the news channels because we cannot take the weight of watching and hearing more details and more pain, let us realize that there are things we can do, ways we can step into to the fray and offer freedom through Christ. We ARE the light in these dark days. Do not turn away yet . . .
Church- we can't NOT be changed by all of this again. We can't sit by and watch and NOT DO anything. Where are our convictions? I am one person, what difference can I make? We don't have any "extra" money to donate. I don't have any time to organize one more project. We don't really know anyone directly affected. My challenge is simple enough - By God's grace and design we are where we are to offer freedom and light to those we are around. Whether it is the cashier at Kroger's or our closest friend, we can live Jesus out to them. A smile, a kind word, a listening ear . . . True they may not be a victim of a hurricane or a survivor of a mass shooting, but we may or may not know the turmoil inside of them. Chances are we have not even taken the time to contemplate their life situation or history. So, take time to play with your kids. Be intentional to really listen to the lady who talks A LOT. Look the stranger in the eye. When given the opportunity speak hope into the despair. Combat the hate with love. Sooth the anger with gentleness. Share truth with compassion and abandon. All to and with the people we live beside and with everyday. These aren't just happy, abstract thoughts, but literal opportunities to fight back against the very real ruler of this age. 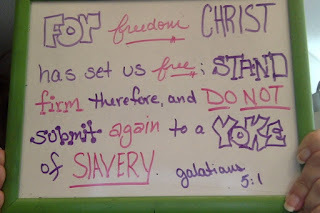 We have been set free from his rule and reign - Let's make it habitual to live in freedom in such a way that Christ can use us to set others free as well. 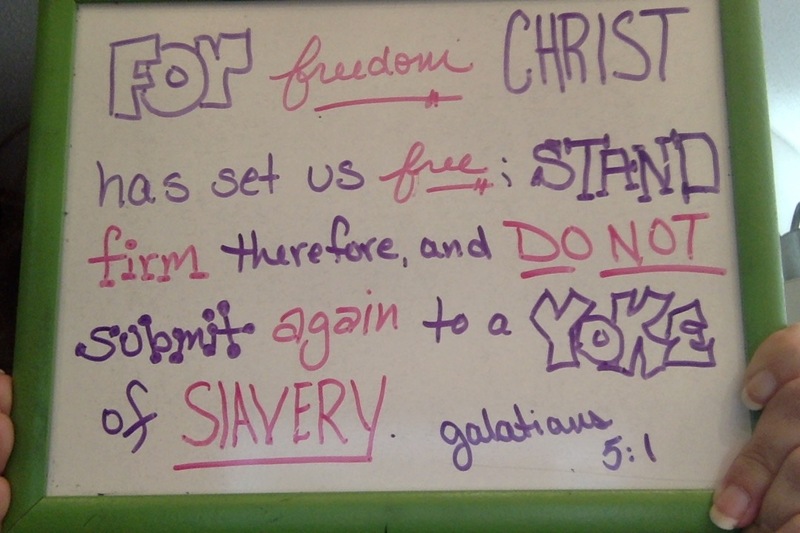 "... do not submit again to the yoke of slavery." "Opinions are like noses; everyone has one!" Everyone seems to have an opinion about everything these days. AND everyone seems to feel the need to share their opinion with everyone else. Social media has provided a platform for people to say things in ways that they would never actual voice to anyone out loud. Hiding behind a keyboard and screen we've gotten pretty bold and brave. Sometimes, we are seeking to validate our opinion by gaining "likes." Or maybe our intention is to stir the pot in the guise of generating "discussion." Regardless, everyone seems to have something to say about everything. The topic "du jour" is always changing and is always "hot." These opinions may be based on "fake news" or credible sources but they are all formed through our individual past exposures and experiences. We are quick to judge our "friends" based on whether or not they agree with our opinions, even if we aren't typing out our stand on the issue. "I knew I liked her!" "Can you believe he said THAT?!" Sinful tendencies such as prejudices and racism creep into our inner thought dialogue despite knowing that as "Christians" we dare not type them into our status updates. Often forgetting the graces that have shaped our current circumstances and worldview we pick sides and vilify anyone whose opinion differs from ours. Lines are drawn and we sit in judgment over those that fall short of the standard that we have decided makes someone good or bad, right or wrong. Recently, while reading "The Accidental Feminist" by Courtney Reissig, I was challenged to think through the differences between opinions and convictions. Not everyone has conviction. While someone may have opinions on everything, she may only have convictions on a couple of things. Convictions are formed over time and study and experience. Convictions, fully formed and rooted within us, compel us to act without thinking, yet if needed we can articulately explain them because we have invested ourselves within them. As Christians, our convictions MUST be firmly and only found in our growing knowledge of our God and His Word. As such, we must display His grace in circumstances and situations when we are confronted with others who have opinions and convictions that differ from our own. We must define our Biblical convictions separating them from our own self-formed opinions. As humans, whether we claim Christ or not, we all act out what we believe. The presence of morals in any one person shows that on some level we are convicted that there IS a right and a wrong. That is why we watch the news and can ALL be appalled at the acts of one man in Las Vegas last night and we can ALL applaud the acts of heroism displayed in the face of such evil. In the light of current events and the volatile political climate, we MUST hold to our convictions and influence those around us the way Jesus did. He didn't backdown, but He always loved. He dealt with compassion with those seemed the most different from Him. He understood that there were those who would never understand or believe His convictions, but He never sinned against them. He prayed for them even as they crucified Him. . . I can't say that I've done the same . . .